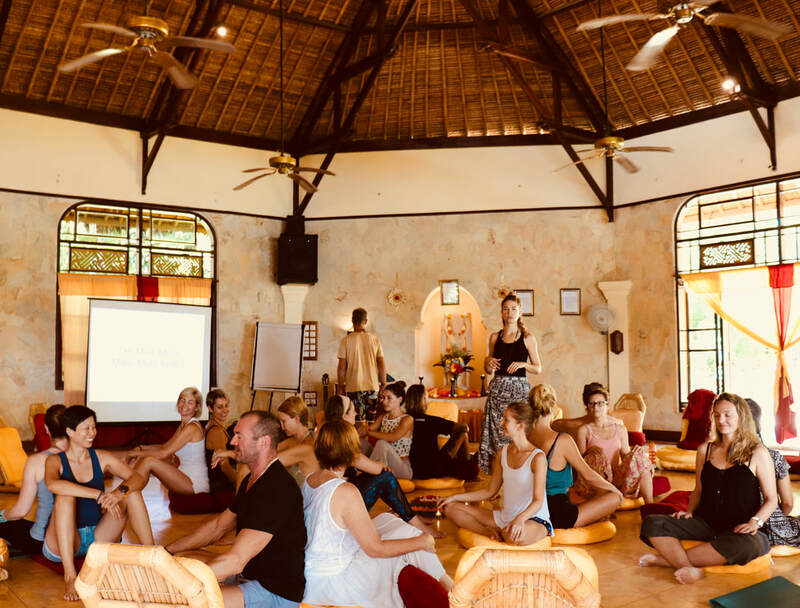 We love so much to share our wisdom in Yoga Teacher trainings and after years of par taking in countless yoga trainings as a student and facilitator, we have discovered a " Voice and Mantra module" makes your TT very unique and stand out from the rest. (our humble opinion) We are passionate about supporting new Yoga teachers to feel confident in their delivery of asana, speak from their heart and also balance the physical learning with the devotional and ritual aspect of yoga. Over the past 5 year we have tailored 'Voice and Manta' modules for..
"I had the great pleasure to be in the presence of Lulu and Mischka as a part of an advanced 300 hour yoga teacher training in Peru. Although I had not worked with Lulu or Mischka prior to inviting them to share with our group in the Sacred Valley, they had come highly recommended as talented musicians and skilled kirtan leaders. What I didn't know was that by bringing them in to connect with our students, we would get far more than a kirtan experience. Lulu and Mischka offered the beautiful gift of sharing their wisdom of sound in a Voice of Yoga workshop. As they joined us for the day, it felt as though they were immediately able to tap into what our group needed on a personal and collective level. The work was heart centered and provided each student the ability to explore sound in an expressive and creative way. With playful games and exercises, they were able to facilitate a workshop that brought together vocal techniques with emotional expression in an enchanting way. There was something about them teaching as a couple that struck many of our students and inspired the concept of living our passions. In addition to the workshop, they lead an incredible kirtan which gave everyone the opportunity to practice that which they had learned in the workshop. As a facilitator myself, I was truly impressed with their ability to hold space and would highly recommend Lulu and Mischka as a beautiful fit for a yoga teacher training or retreat." ​"Lulu and Mischka are two divine beings that know what is means to be connected to spirit acting as vessels for the facilitation of others self expression through voice and music. They were also very organized an thorough in their delivery to a group of 'yoga teachers to be' , innovative and fun, delightful and grounded they instilled the kind of trust required for students to get out of their comfort zone in the much needed yet sensitive arena of vocal expression through song. We look forward to continuing the journey!" "It was such a gift to have Lulu and Mischka present a module on “voice” for our recent 200 hour teacher training. The students learnt so much about mantra, voice, expression, chanting - and so much more! It was incredible to have such shining examples of bhakti yoga to inspire our blossoming yogis. Thank you for bringing your sweet, heart-felt vibes to the group."